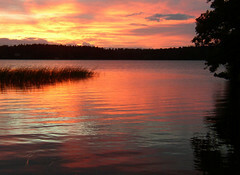 Another gorgeous sunset tonight in the Stockholm area in Sweden, the 27th of july. Time 9:55 PM. There have been many wonderful sunsets this summer and the reason must be the bad weather (!?) with cloudy skies in the evenings. Last summer was hot and we always had a clearblue sky. This night was extremely beautiful with almost red sky & water and I didn´t do much about the photo here, just some cropping and contrast.